What's the latest in destination weddings? The honeymoon favorite, French Polynesia. But don't rush to invite everyone yet. 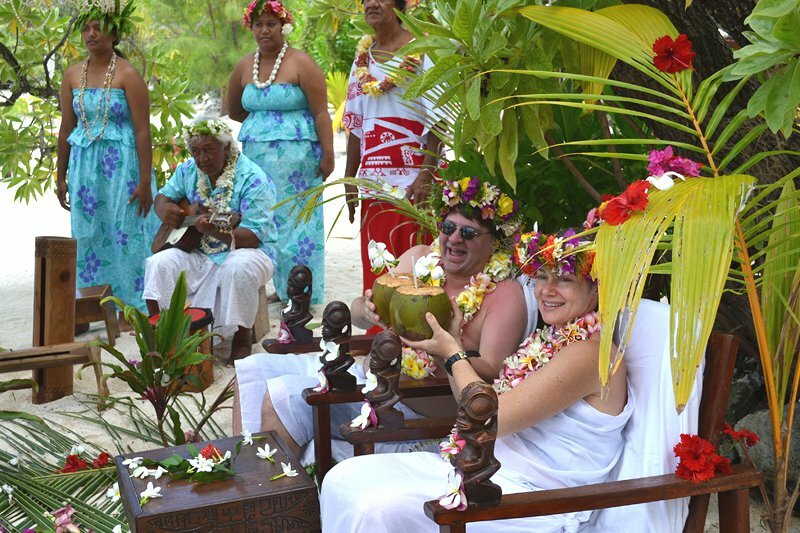 FRENCH POLYNESIA – Last week, I got married in French Polynesia. Okay, the wedding was fake — in the sense that I was already married to my island bride — but that might have been for the best. How did this happen? My wife Erinn recently got the tough assignment of reviewing honeymoon and wedding destinations in Tahiti, Moorea, and Bora Bora, and I tagged along. As we were the only couple in the group, we agreed to participate in a mock wedding. It ended up being the fourth such ceremony of the trip — these islands are really pushing themselves as destination wedding sites — and my fellow travelers could be forgiven if they were a bit jaded. But actually, everyone had a great time. Visually, Polynesian culture expresses itself in very unironic kitsch. Even if your experience of the region doesn't extend beyond the three-part Brady-Bunch-in-Hawaii saga, you can probably imagine what a Polynesian wedding looks like. Ours took place on the beach of a private island off the coast of Moorea. The tiki-adorned chairs for bride and groom were, thankfully, shaded by palm trees. Rows of flowers and palm fronds led out to the coral reef to water the color of disco-era mascara. The Tahitian priest wore an elaborate red headdress and spoke only in Tahitian. My wife and I were separated, and I was led away to a hut so I could tie a "pareo" — really just a white sheet — around my waist. My native attendant and I communicated in very basic French; not knowing the phrase for "going commando," I kept my bathing suit on. It didn't clash too much with the flowers around my neck and on my head. The best part was the bride's entrance. As the ukuleles strummed, Erinn came to shore on a boat, doing a mock-queen wave. It was painfully romantic, though my stomach was heaving in laughter. It was the best of both worlds: all the pageantry of a wedding with none of the anxiety. We exchanged some vows in Polynesian, and our wrists were tied together with a leaf. Later, we were bundled together in another pareo. Then came the dancing. This is an aspect of Polynesian culture I could easily skip. Not that the dancers were untalented, unenthusiastic, or unattractive. (In fact, there were a lot of jokes about how my wedding and bachelor party had been combined.) But suffice it to say that there has been little innovation in the art of booty-shaking over the last, oh, few thousand years. Once you've seen the moves, it all gets a bit repetitive. Being required to stand and gyrate only made the experience more humiliating. There are worse fates, however, than being humiliated amid exotic beauty. This is, after all, practically the archetype of exotic fantasy. A catamaran ride at sunset, with a mai tai in hand, will assuage any stress that might linger from the ceremony. Then take a midnight dip straight off the stairs of your bungalow, with only Orion there to see whether you're skinny or not. Still: Do Americans really want to get officially married in French Polynesia? I'm pretty skeptical. It's only recently become legally possible, and, based on a briefing we had with a legal expert, it seems pretty complicated, a tangle of French bureaucracy. Not only are there a lot of , but we were told they'd have to be translated into French. You can hire local fixers for some of the paperwork, but it's hard to believe that anyone lacking a genuine tie to the region would want to deal with all the headaches. Moreover, if the marriage ever ends up going sour, the divorce would be governed by French law. Better, I think, to get hitched in your home country, then go to French Polynesia for your honeymoon — and get fake married like I did. - : very new and very modern. - : gorgeous. Jim's favorite island. - : a little shopworn but has the best food. James is a writer and editor in New York. Prior to becoming a father, he traveled for the heck of it.